MAE LA, Thailand — Eighty-year-old Karen refugee Naw Pe lies near the cooking area in her bamboo hut, surrounded by pans, pots, baskets, and rotting foods. She has a fever, coupled with the stifling midday heat, and her hands shake as she moves out of her mosquito net. Naw Pe lives alone in Mae La, the largest refugee camp on the Thai-Burma border, home to more than 30,000 people, according to estimates. Her family have stopped visiting her and she refuses to seek help at the camp’s clinic. Humanitarian assistance including food and health is dwindling at the camp, as international governments and donors cut their funding to reflect gradual movement in Burma’s peace process. For Mae Le’s refugees, it means a tougher existence. Some have moved to other countries with a UN resettlement program, others find their own way to safer nations. But returning to Burma seems pointless—perhaps dangerous—for many as they no longer have property or relatives in their homeland, and fear for their safety despite ongoing peace talks between the Burma Army and ethnic Karen armed organizations. Military offensives in eastern Burma’s Karen State from the 1970s to the 1990s forced Karen civilians and other ethnicities from their home. Many fled into neighboring Thailand and have been living there for decades. Since the launch of Burma’s peace programs in 2011, many international donors and NGOs supporting nine refugee camps along the Thai-Burma border have shifted their focus from humanitarian assistance to repatriating the refugees with the help of the Thai and Burmese governments. Ethnic armed organizations (EAOs) such as the Karen National Union (KNU) and the Democratic Karen Buddhist Army (DKBA) have signed ceasefires and the Nationwide Ceasefire Agreement (NCA) with the Burmese government. Some refugees only want to check the situation in Burma, and so don’t contact the camps’ “volunteer repatriation centers,” which help those who want to return home. “I don’t know if other people trust the ceasefire and peace process, but I don’t,” says Pleh Gaw, 30, a slight man sitting in his hut. Several armed groups have split from the KNU since 1994, including the Democratic Karen Benevolent Army (DKBA), the Border Guard Force (BGF) and a smaller group called the KNU/KNLA Peace Council. With support from the Burma Army, the DKBA launched an offensive against the KNU that displaced thousands of civilians. Even after the ceasefire, sporadic battles between the Karen armed groups have been reported. “I don’t know which group I should trust,” frets Pleh Gaw, cradling his son. “We even heard there was fighting recently,” added his mother, Mu Kyu Lar, 59, in reference to a clash in KNU-controlled territory between the KNU and Burma Army troops in Tenasserim Division on April 22. “When we fled, Pleh Gaw was seven years old, too young to know anything. I had to carry him all the way,” says the mother-of-four, drawing on her hand-rolled cheroot. Mu Kyu Lar and her family, who come from KNU’s Brigade 7 territory, have been living in Mae La for more than 20 years. NGOs estimate that more than 80,000 refugees—mostly ethnic Karen—fled the civil war. The population of the nine refugee camps has been steadily declining—reduced from more than 140,000 in 2011 to about 98,000 now, according to The Border Consortium (TBC), a group comprising nine NGOs that supports refugees who have fled conflict in Burma. TBC is reducing its staff and lowering their salaries because of funding shortages. Its annual staff budget is about US$1.7 million but funding for the coming years has not been secured, says TBC executive director Sally Thompson. “Inevitably there will be difficulties, but this is the reality we have to face as funding support for camps continues to decline,” she said. 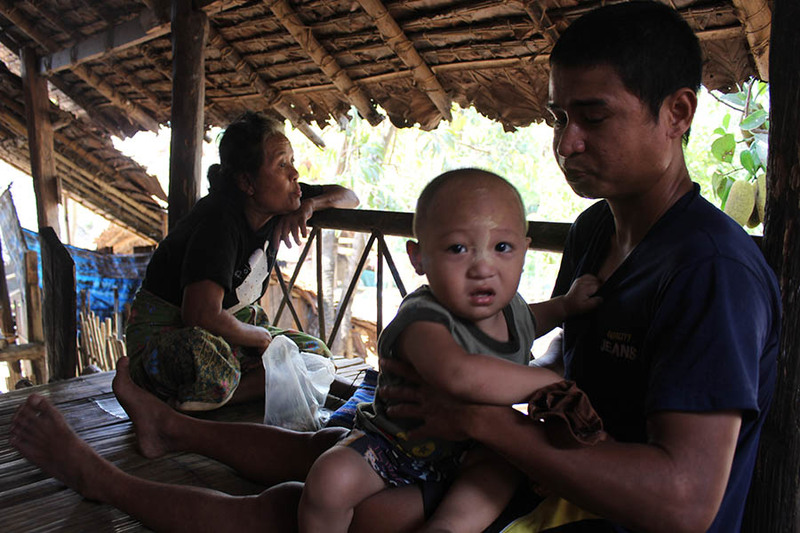 About 10,000 community workers in the nine refugee camps on Thai-Burma border will be affected by the cuts. “We are also feeling the pressure,” said Saw Tu Tu, a head of the Karen Refugee Committee (KRC). 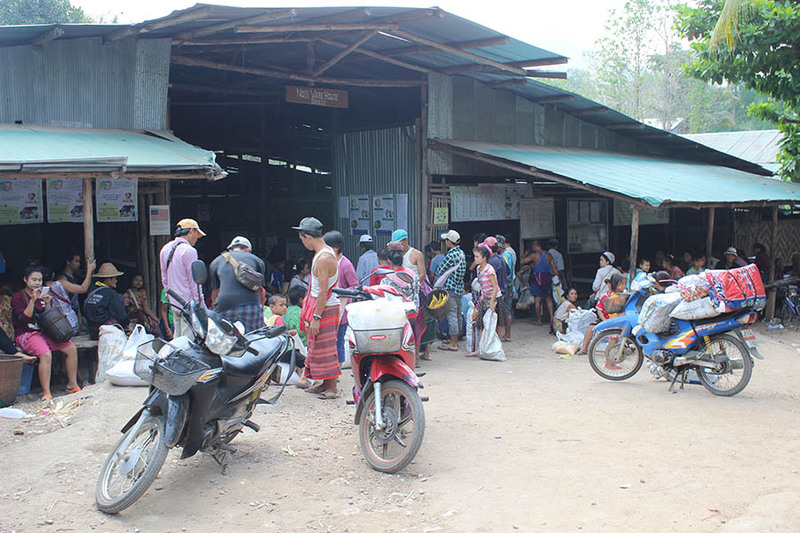 Refugees in Mae La say local authorities, such as the Thai security guards and the International Organization for Migration (IOM), restrict their movements. Community leaders are asked not to speak to media due to pressure from the authorities. “The population in Mae La has been decreasing yearly—sometimes by several hundred,” says Saw Tu Tu. “We have had over 40,000 in the past. Now, there are 38,000 people in our camp,” he adds. Home is not the United States or even Burma for some long-term refugees like Naw Pe, the sick, elderly woman.